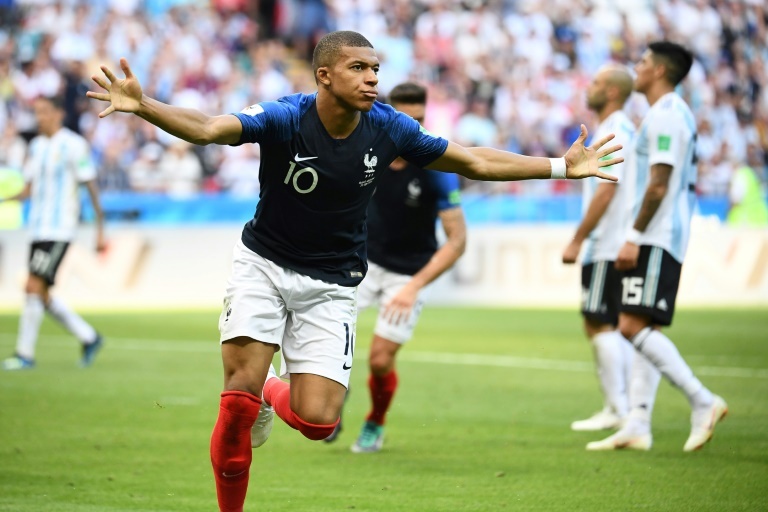 Teenage star Kylian Mbappe struck twice and earned another goal as France thrillingly found their attacking edge to beat Lionel Messi's Argentina 4-3 and move into the quarter-finals of the World Cup on Saturday. Billed as Messi's chance to reignite stuttering Argentina's hopes, the pulsating last-16 clash in Kazan instead saw 19-year-old Paris Saint-Germain star Mbappe become the youngest player since Pele in 1958 to score two goals in a World Cup match. France cast aside the cautious approach from their first three games and confirmed their status as one of the favourites. And Mbappe, born in the same year that France won the World Cup in 1998 when current Bleus coach Didier Deschamps was captain, announced himself on the biggest stage. "It's flattering to be the second teenager (to score twice in the World Cup) after Pele but let's put things in context: Pele is in another category. But it's good to be among these people," he said. "We showed an excellent attitude, I'm very proud of the players and I'm very happy for them," said Deschamps. "We created a huge amount of chances. If we'd scored them all, the scoreline could have been far heavier." Embattled Argentina coach Jorge Sampaoli had promised an "aggressive, attacking" approach from his side after they scraped through the group phase. But his fears over the superior speed of France's strikers were quickly proven right when Mbappe sprinted from his own half and Marcos Rojo hauled him down. Mbappe's PSG teammate Angel Di Maria levelled with a 41st minute long-range stunner and the South Americans were back in what was proving a superb match. Argentina took a 2-1 lead minutes after the restart when Gabriel Mercado clipped Messi's low curling shot past Hugo Lloris. 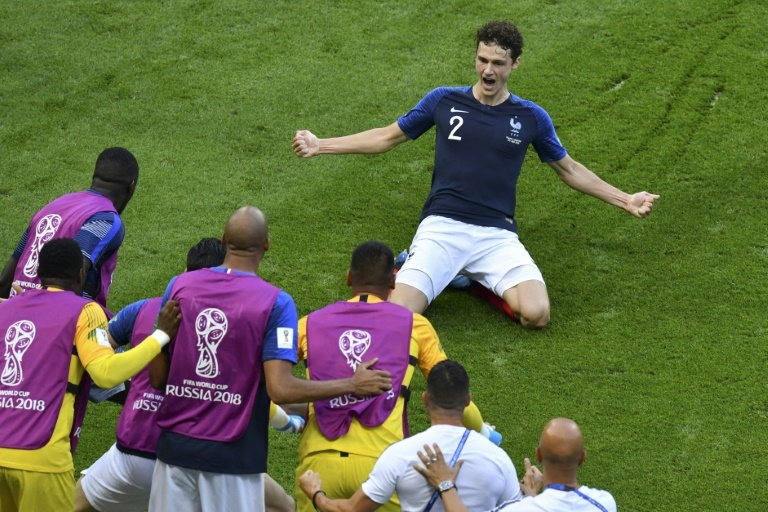 Defender Benjamin Pavard's stunning half-volley levelled for France on 57 minutes and as Argentina lost hope, Mbappe struck in the 64th and 68th minute to seal France's place in the last eight. When Blaise Matuidi's shot was blocked just after the hour, Mbappe was on hand to restore France's lead with a low shot past Argentinian 'keeper Franco Armani. Then the teenager ran on to Olivier Giroud's perfect pass on a France counter-attack to arrow in another shot. Despite a late consolation for Argentinan when Sergio Aguero headed Messi's superb long cross past Lloris in stoppage time, Mbappe had already well and truly stolen the show. With France's players boasting an average age of 25, Argentina coach Jorge Sampaoli admitted their "fast" players, particularly Mbappe, had hit his ageing squad hard. "They have very fast players who are good at moving from defence to attack, and that's exactly what Mbappe did," said Sampaoli. "I'm sorry for the result, and frustrated, that's normal. But I can't fault my players. "We fought hard to get back into it and came close to levelling at the end."